“Marines! On the ready line!” One of the many aspects that helped make Aliens so special was the memorable characters. Would Aliens have been anywhere near as successful without Vasquez or Hudson? And would we have cared so much when they went down fighting? So memorable characters that leave an impact are a vital part of any Aliens or Colonial Marines related project. And this is something WayForward took seriously when crafting Aliens Infestation. Below, the WayForward staff talk about crafting those characters. So we’ve talked a lot about developing our tiny Marines. But what exactly went into that? Just how fleshed out are these soldiers, and why should players care when they die if there’s always another one right around the corner, waiting to take their place? The game features 20 Marines: 19 of which are playable, and one which is your Commanding Officer, Patrick “Stainless” Steele. 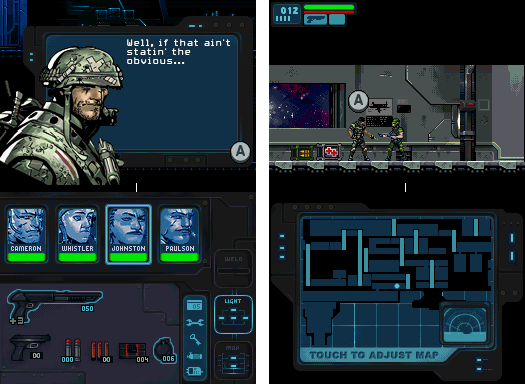 Steele contacts you via radio throughout the adventure to offer intel, and to give the playable character someone to chat with (in what would otherwise be a pretty quiet game). Easy enough. Each of our Marines was given a unique name, rank, blood type, and backstory (written by our lead designer and writer, Cole Phillips). These mini-bios were critical in informing us of each Marine’s personality when it came time to write their dialogue (more on that below). 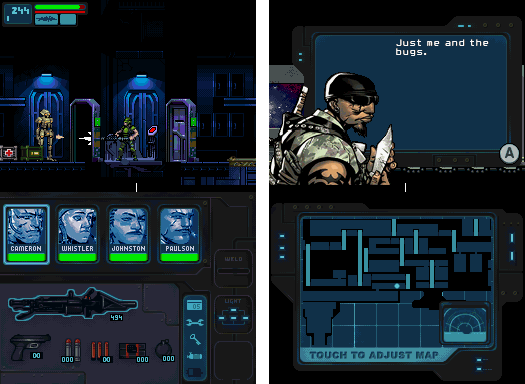 Each time the player comes across a new marine in this game, their bio is added to the Extras menu, under the Marine Roster section. This allows players to learn more about the soldiers they’re encountering in between play sessions. Even though all 19 marines share the same animation sets, we gave each character a slightly different color palette. So some Marines might wear washed-out grays, while others have a bluish or even purplish hue. This visual difference makes swapping between each character feel more like a genuine character swap. Added to this were unique ‘long idle’ animations. For those unfamiliar with the term, this is an animation that game characters perform when they’re ‘bored’ (resulting from a lack of user input for X seconds). We decided it was worth creating one unique long idle animation per character, to better reinforce their personality. Each of these animations has the character subtly ‘transforming’ from the default marine into a pose more similar to the Bachalo art. So Amber “Buster” Fischer takes off her helmet to reveal long, flowing blonde hair underneath, while Samantha “Homwrecker” Johnston takes her helmet off, slams it onto the ground, and steps aggressively onto it. Like the Bachalo images, the idea with these animations was that players would carry that detail in their mind and imagine it in the default animations. So when Fischer starts moving again, it feels like her long, blonde hair is hidden under that standard-issue helmet. These animations are seen most notably anytime the player enters a save room, at which point all four characters assume their long idle poses, immediately standing out from one another. Here’s where we went a little nuts (and hopefully, it pays off with the fans). After Cole had written his very cool, James Cameron-esque script for the game, the team re-wrote it…18 more times. The story was kept structurally the same, but every line of dialogue was rewritten in the voice of the character currently being controlled by the player. So players will get that classic, hero dialogue when controlling John “Duke” Cameron. But assuming control of Zoe “Cutter” Kennedy (our dark emo chick) replaces all of Cameron’s lines with moody, morose chatter. Mei-Lin “Beta” Chau (our tech head) speaks almost exclusively in “1337 Speak.” We had a tremendous amount of fun retooling the script in each of the different character’s voices, and the end result ensures players will always read something new dialogue, and get a slightly different perspective on the game, depending on who they’re controlling. We even tweaked the ending a bit for a few of the characters (shhhh). The story of Aliens: Infestation revolves around the Colonial Marines of Alpha Squad and their missions concerning the recent discovery of the USS Sulaco. The ship is still a bit of a mystery and though they quickly find out what happened with it, they still need to figure out the ‘whys’ and ‘hows’ if they can survive long enough. They face off not only against the deadly Xenomorphs, but against hostile soldiers, combat robots, and corporate mercenaries, all dead set on keeping the truth behind the Sulaco incident buried. Because the story is told through the perspectives of 19 different, playable characters, the player is sure to latch on to one of these Marines and form a bond where he actually cares about his character and feels some real emotions when they are put in harm’s way. The story should delight die hard Aliens fans while remaining engaging to gamers new to the series. I’m really proud of what we’ve accomplished with Infestation and I hope you enjoy it too! Here you will find individual character BIOs detailing the backstory on some of the characters of Aliens Infestation described in Part 1. Very unique and iconic Colonial Marines designed by the fantastic comic artist Chris Bachalo.